If you’ve been watching my videos for any length of time, you know I’m a big proponent for getting great reviews about your business on line from real customers. It’s huge. It’s important. It’s very valuable social proof, and it convinces consumers to try your business and your services. Very powerful stuff. Today, I just wanted to give you some proof. I wanted to back up what I’ve been preaching with some facts. First of all, let’s start with the Wall Street Journal who did a study, and they found that 92% of consumers have more trust in, have more faith in what they read about your business on line than what your sales people or you tell them about yourself, about your business. Ninety two percent of consumers believe your reviews and what they read about you on line more than anything that you say. That was in the Wall Street Journal. That’s pretty powerful. Seventy two percent of consumers believe on line reviews to be as trustworthy as personal recommendations from friends and family. Seventy two percent. That’s huge. They’re almost as valuable as a referral from your friend or family member, the people that you trust. That’s a lot of trust. Fifty two percent of consumers are more likely to try your business and services based upon the reviews they read about you. They’re going to give you a chance more likely if you have positive things about your business on line. That’s pretty powerful social proof. Think about it. Think about it in your own life. Think about how you use reviews. When you buy a product on Amazon, when you go on line to search for a product or even a service that you want to use in your own life, what do you do? You read the reviews, and you make a decision. Consumers are doing the same thing about your business. Implement a process that gets you positive reviews from real customers. Make it a part of your business. It’s important. It’s powerful stuff. Let me say one last thing. Imagine if your business is on the first page of Google, and it’s in the Google Plus local listing area with your name, address, phone number. Those are all visible, and you’re up there with ten other competitors. None of your competitors have reviews, but you have 30 positive reviews. Who are your consumers going to click on? Get reviews. It’s worth your effort. Put time into it because ultimately, it’s going to make you money. Over and out. See you. 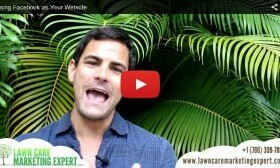 ‹ More Lawn Care & Landscaping Leads Than You Can Handle? Here is What You Can Do. This is good advice, but how do you get customers to review you. And what is the best place for them to post them? I’ve seen a lot of reviews on yelp but not sure if therez a better place to lead my client to so they can post a review. The simple answer is to ask for them and make it as easy as possible for clients to do it. In addition to our local search optimization service we give our clients a complete step by step guide on exactly what to do and how to use reviews and testimonials. Google Local is the best place to get reviews if you are short on time.